Hieroglyphics just never seem to get old. The original type of tablet. 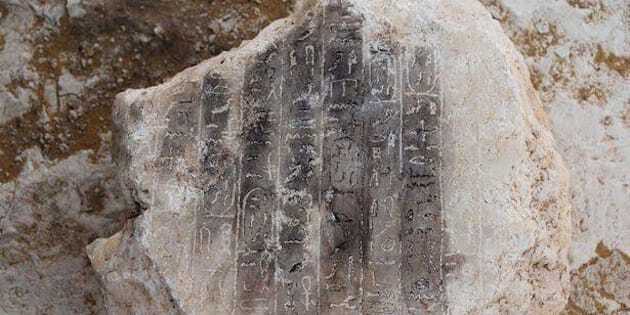 Remains of a new Ancient Egyptian pyramid have been discovered south of Cairo. The Egyptian Ministry of State for Antiquities has said the remains could date to the 13th century pharaonic dynasty, making them approximately 3,700 years old. Corridors of the pyramid and a tablet with ten lines of hieroglyphics were among the findings, and are in excellent condition, the Ministry says. The new pyramid was discovered in close proximity to Dahshur's royal necropolis, where Ancient Egyptian King Sneferu lived during the 4th Century BCE. He was responsible for constructing both the Red and Bent Pyramids, which are regarded as early examples of Egyptian pyramid architecture. Sneferu was succeeded by is son King Khufu who went on to build the pyramids at Giza. The new discoveries are said to be part of the interior of the Bent Pyramid. While the excavations are in their early stages, Adel Okasha, the head of the Dahshur necropolis, said that the newly discovered remains could belong to the inside of the Bent Pyramid and will have a unique role in providing insight into the design of the structure's interior. General Manager of the Egyptian Ministry for Antiquities Essmat Sonay celebrated by posting photos of the discovery to social media, and honestly, they are pretty cool.